Depending on your age, you’ve probably seen at least a few generations of technology. It’s amazing how quickly the sizes and shapes of our gadgets can change as the technology improves. The Chicago Tribune compiled a photo essay of gadgets that once were futuristic, but now might as well be from the Flintstones. Above: the fabled videodisc, predecessor to the modern DVD. There are few technologies that have grown as quickly or as dramatically as telephones. 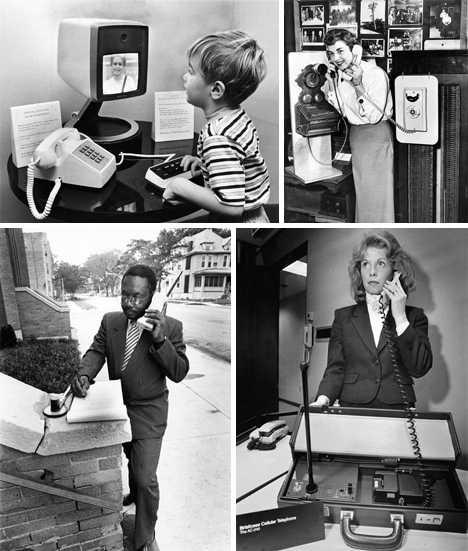 Above, a child uses one of the first picture phones in 1972 and an operator demonstrates old and new (at the time) telephones in 1955. The new telephone is a rotary dial, something that would completely baffle most young people today. Also above, the changing cell phone: left, the “brick” phone in 1989. Right, the 1985 briefcase telephone with its own built-in transceiver. Everyone loves listening to music while on the go, and today we have itty-bitty MP3 players that we can conceal just about anywhere. Previous generations of portable music were slightly more conspicuous. 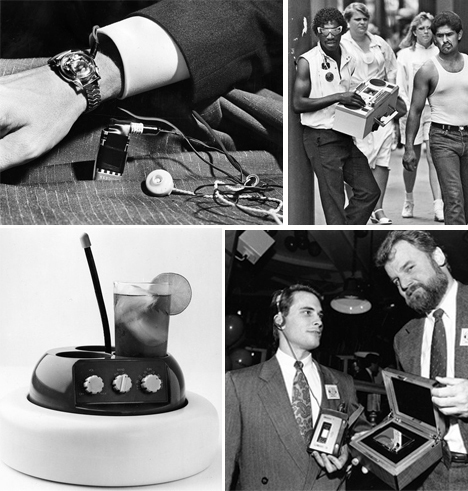 The 1956 wrist radio above was revolutionary for its time, but you were at the mercy of the local DJ. Above right, the 1986 boom box was awesome for not only listening to your favorite cassettes away from home, but also for building up your biceps. Bottom, the floating radio/cup holder and Sony Walkman: two music gadgets the teenagers of today have probably never heard of. Plenty of people today are into online poker, but how many of us remember where it got its start? Here, Atari Blackjack is demonstrated at a 1980 gaming convention. And the video game/fitness mashups we see today aren’t a new concept, either. Above right is a 1983 fitness system designed to get avid video game players to do something, you know, in the real world. The faster the user pedaled, the more control they had over the in-game features. We are a nation of entertainment enthusiasts, no doubt about it. Above, factory workers assemble some of the first TVs that found their way into American homes in 1950. Above right: we think nothing today of carrying movie-playing devices in our pockets. But in 1988, the Video Walkman was a huge deal. There were about 100 movies available for the mini movie theater. Bottom: video cameras two decades apart. 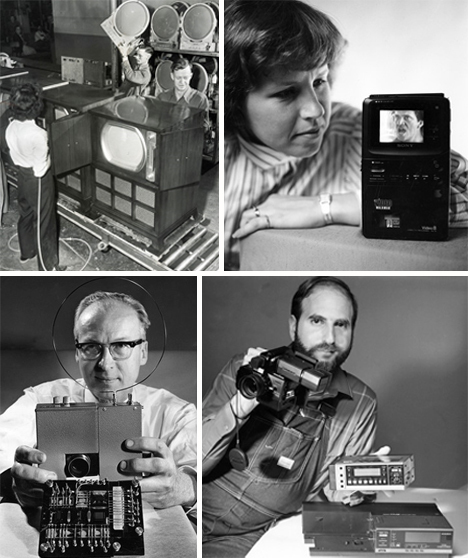 The left is one of the first tubeless video cameras in 1966; on the right is a “miniature” camcorder from 1986. Computers are now present in just about every home, school and business in the country, but it hasn’t been that way for very long. 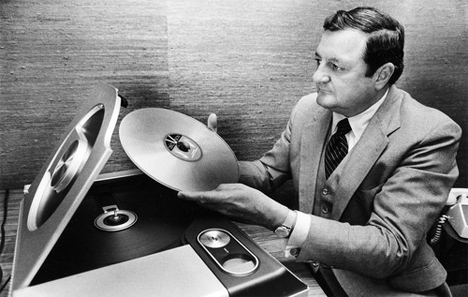 Top: in 1979, a lawyer looks up information on his Lexis research computer. Lexis is still in business (as LexisNexis) and still offers a huge searchable database for lawyers and journalists. 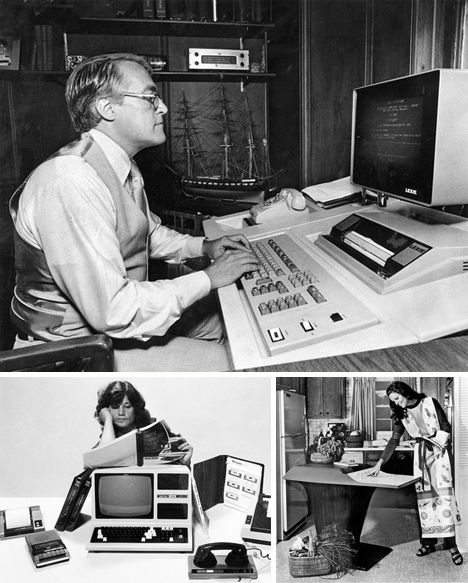 Bottom left, 1983 computing looks complicated. A woman reads the instruction manual for her $2700 worth of home computing gear. And bottom right: can you spot the computer in this picture? Turns out it’s the big freaking table taking up half of the room. This 1969 Honeywell home computer was supposed to do something for everyone in the whole family. Too bad you had to get rid of your living room furniture to fit it in the house. With the purchase of this beauty was included a two-week course in programming so that you could learn to use its features. See more in History of Tech or under Vintage & Retro. October, 2009.